Product prices and availability are accurate as of 2019-04-22 18:44:11 EDT and are subject to change. Any price and availability information displayed on http://www.amazon.com/ at the time of purchase will apply to the purchase of this product. Camu camu is a low-growing shrub found throughout the river corridors of the Amazon rainforest of Peru and Brazil. The camu berry is one of the world's most abundant sources of vitamin C. The superfruit can provide as much as 60 times more C per serving than an orange! The superfruit also contains a broad range of other important nutrients including antioxidants, amino acids, beta-carotene and potassium. The small red fruits, which look like tiny apples, are sustainably hand-harvested by family farmers that expertly navigate their shallow canoes in the swampy habitat in which camu shrubs thrive. 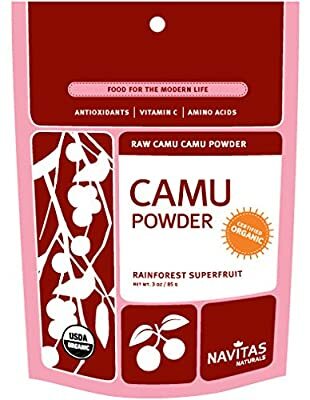 To make Navitas Naturals Camu Powder, the seeds are removed from the berries and then they are milled at low temperatures into a fine soluble powder. Many people in Peru enjoy camu-flavored ice cream, sweets and beverages. 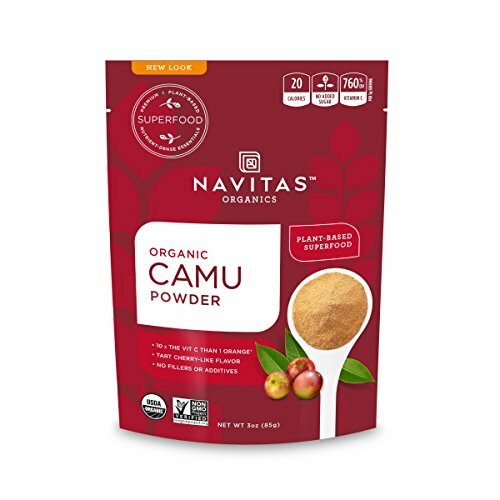 Navitas Naturals Camu Powder is a red-orange powder with a tart berry flavor. Camu purists enjoy a simple “camu punch” by stirring a spoonful of the easily dissolvable powder into a glass of water and adding a touch of natural sweetener. Camu powder also provides a tasty superfruit boost to juices, smoothies and yogurt. 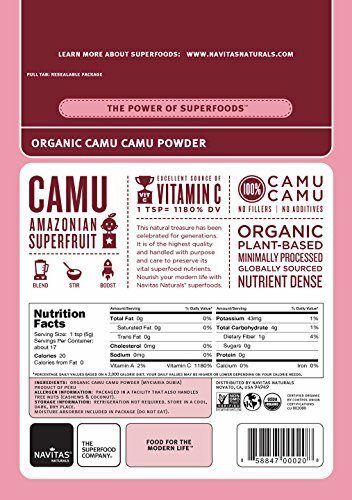 Camu Camu, a tart cherry-like superberry from the Amazon, has an incredible antioxidant profile - including more vitamin C than any other known food! 1 teaspoon provides 10 times more vitamin C than an orange (760% DV). 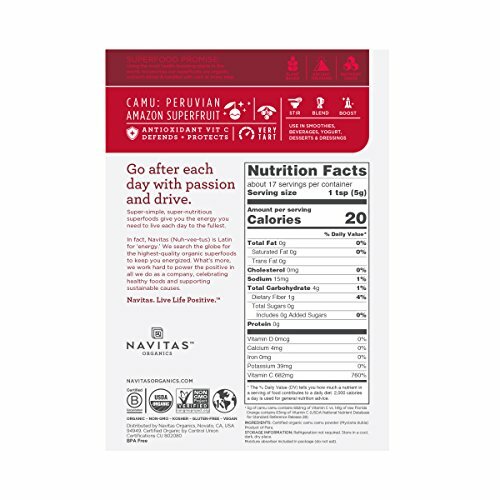 Low-temperature dried to preserve its rich nutrients, Navitas Organics Camu Camu Powder fortifies your system to support longevity and vitality. Add to smoothies, sweet beverages, dressings and desserts. USDA Organic, Kosher, Non-GMO, vegan, gluten-free.